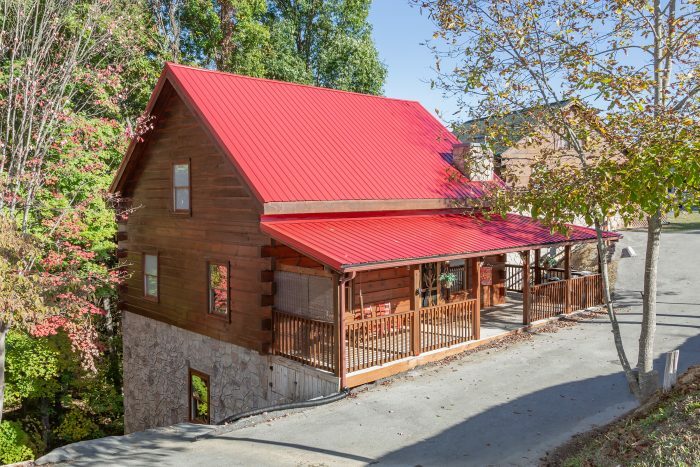 You'll never want to leave "Mountain Time" after your vacation to this 5-bedroom cabin near Pigeon Forge. 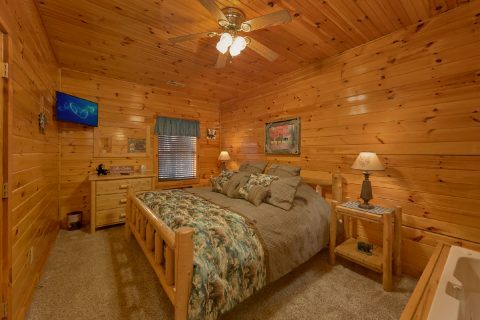 Here, you'll find a comfortable cabin with all the features you could want for a Smokies vacation to remember. 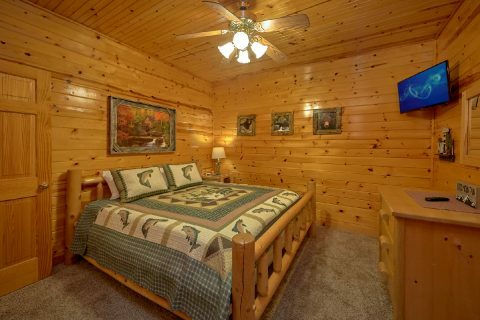 Even better, your cabin places you only minutes away from the fun and excitement of the Pigeon Forge Parkway! 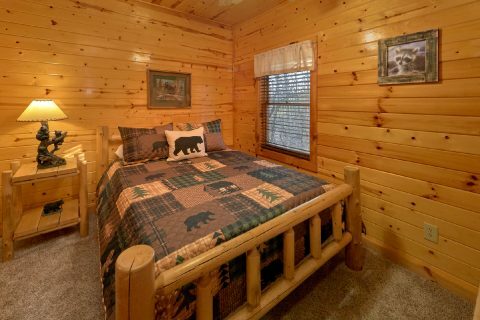 Your cabin’s location is one excellent perk to staying at this exceptional lodging. You’ll be only minutes from top attractions in Downtown Pigeon Forge including The Island and Dollywood. 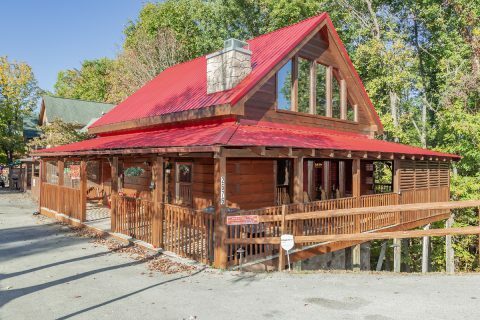 You can also easily access the natural beauty of the National Park and the fun and excitement of Gatlinburg. 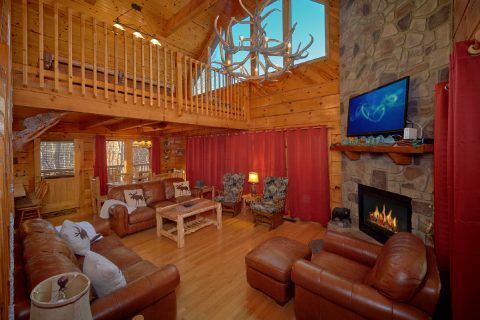 While you’ll enjoy plenty entertainment options around your cabin, this 3-level cabin provides guests plenty of entertainment options along with an excellent cabin interior. 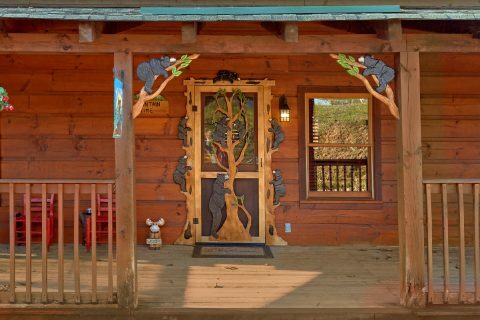 Once you enter through the charming front door decorated with adorable black bears, you’ll find everything for up to 10 guests to enjoy an entertaining time during their cabin stay. Host a gathering in the front of the glow of the gas fireplace with stone mantle in the living room. 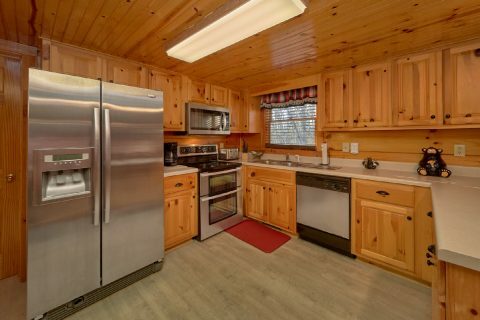 Cook everyone's favorite meal in the full-kitchen and chat about your Smoky Mountain adventures over great food at the log-style dining table. Upstairs, the fun can continue after dinner. 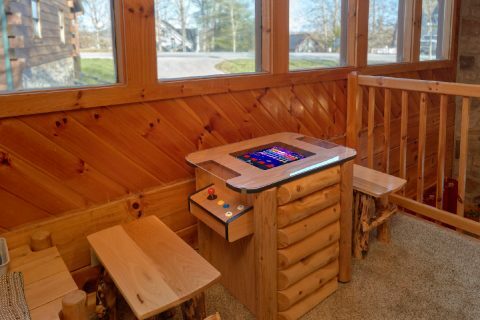 On this level, you'll find a game area that the whole family will love. 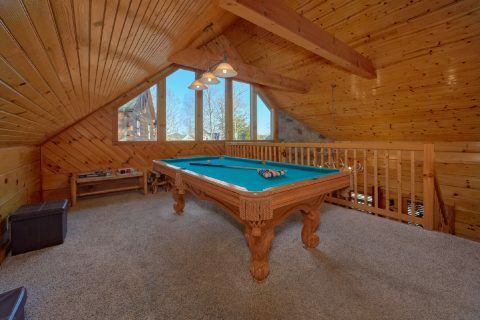 Enjoy a friendly billiard competition on the pool table or challenge each other to set the high score on the sit-down multi-game arcade game. 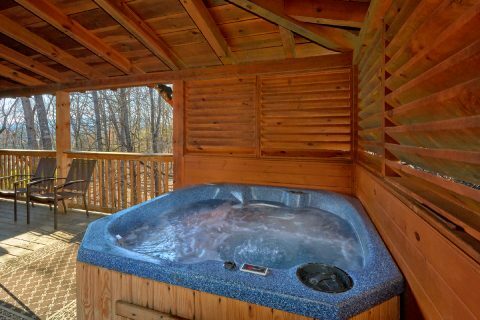 After so much fun and excitement, you’ll want to unwind. 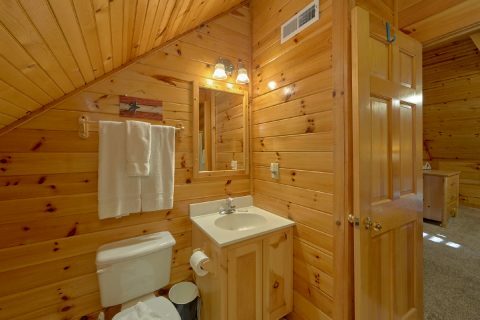 Luckily, there's also plenty of space to relax in your cabin as well. 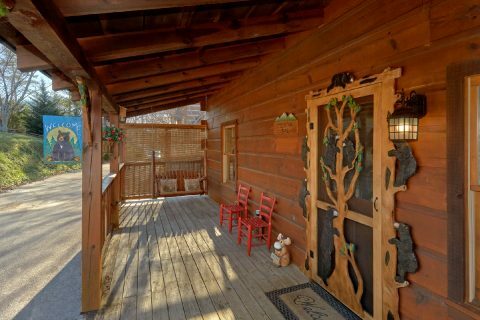 There are a total of 4 king bedrooms and one queen bedroom at this cabin oasis near Pigeon Forge. 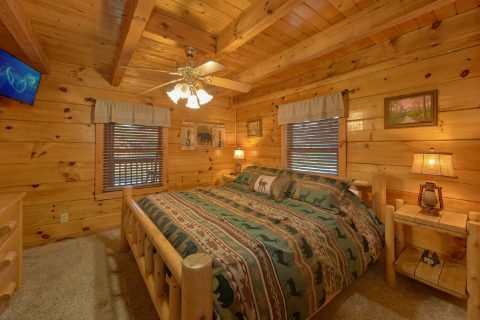 You'll find one king bedroom on the main level, two king bedrooms and one queen bedroom on the bottom level, and one king suite on the top level. 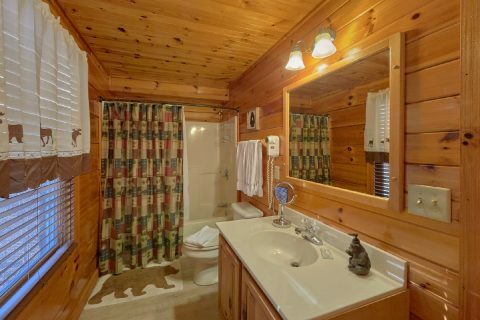 While each of your cabin’s bedroom offers a comfortable bed, TV, and bathroom, one of the downstairs king bedrooms as well as the upstairs king bedroom each offer guests the added bonus of their very own jacuzzi tub for even more relaxation. 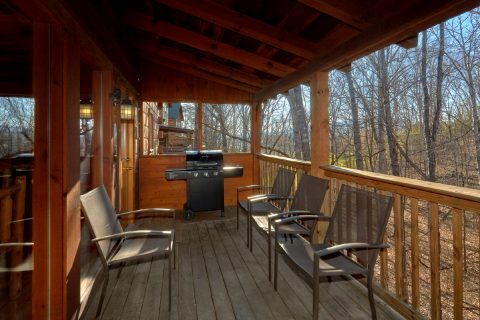 Outside, there’s even more space to relax and enjoy a laid back mountain time while the sights, sounds, and smells of the mountains surround you. Enjoy hosting a cookout with your grill for great burgers on a summer day. 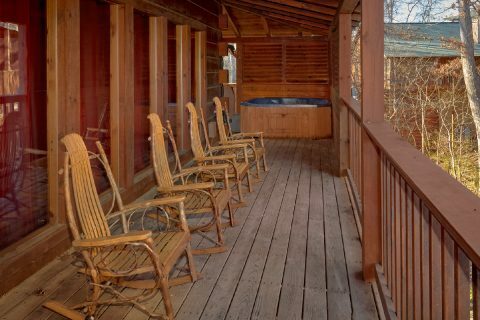 Relax in the rocking chairs while the sun sets on a great day in the Smokies. 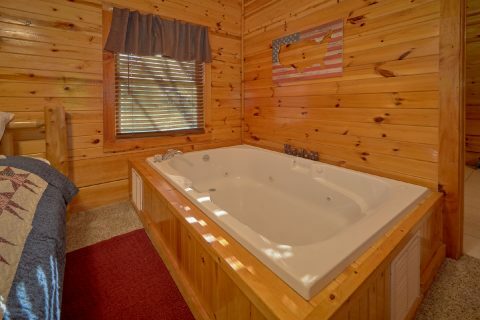 Spend the evening relaxing under a starlit mountain sky as you relax in the warm waters of your hot tub. 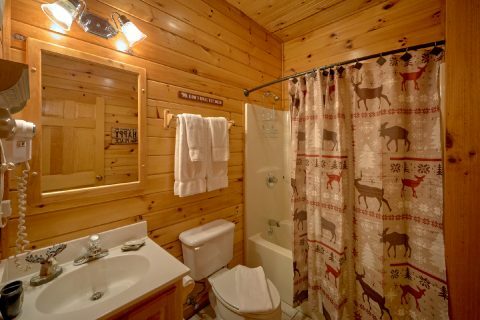 "Mountain Time" is located just down the road from "Up to Nut’n," making this pair perfect for groups looking to stay near each other. 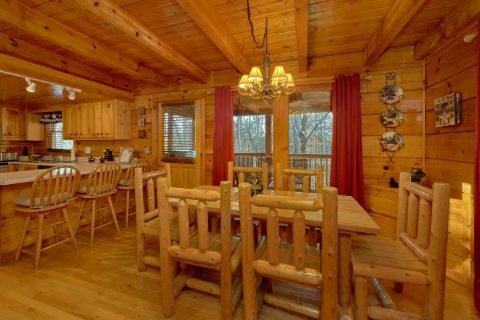 Our reservations specialists can assist you in booking multiple cabins for your group vacation. 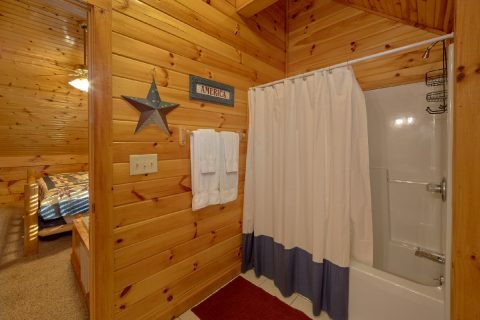 This cabin also features everyday conveniences to make your cabin stay even more comfortable. 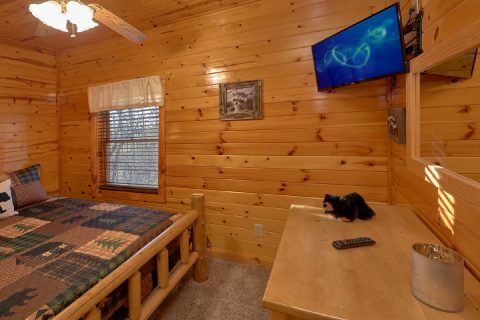 You’ll enjoy streaming movies and games with your cabin’s WiFi internet. 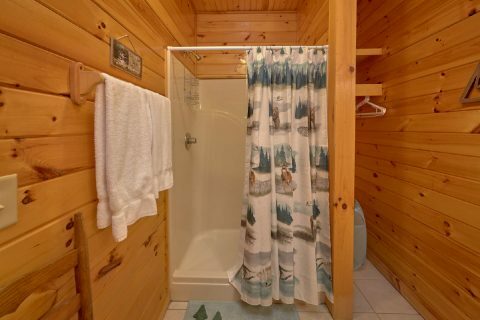 Pack lightly for extended stays with an in-cabin washer and dryer. 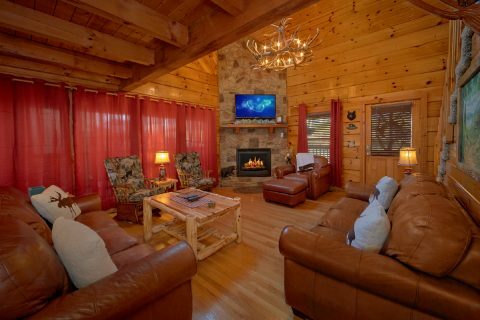 Head to the Smokies and relax on "Mountain Time" for your vacation! 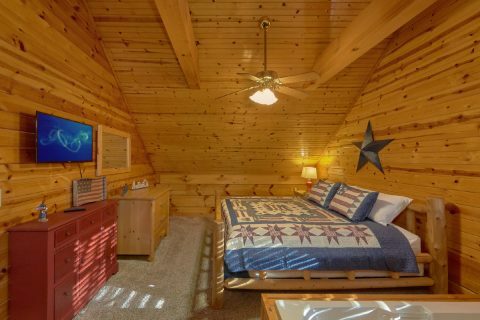 Book this 5-bedroom cabin near Pigeon Forge online today and receive a 15% booking discount!